My gosh enough snow already. I am counting the days until sun shine. 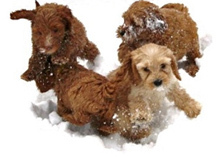 THe puppies have only been out a couple times to play in the snow. Now it is too soft and deep for them to play in. Hopefully I can get them out to play on the back porch tomorrow. I love them to get out and get fresh air. Watch for the new pictures tomorrow.